A leaf shutter is a type of shutter, in which the moving element is a small number of identical, overlapping metal blades, called leaves or blades. These open and close in order to expose a photograph. THe shutter is usually within the body of the lens, somewhere near the diaphragm. The leaves are arranged in a circular pattern, suitably pivoted near the housing periphery, and made to move in a rapid oscillating fashion such that they together uncover the common central area for a predetermined period of time, enabling a picture to be taken. The shutter mechanism is governed by a clockwork mechanism and powered by a strong spring tensioned by setting the shutter before each exposure. The delay between opening and closing the blades determines the exposure time which usually may be adjustable within a specific range for the photographer to choose from. 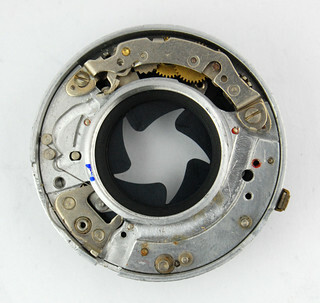 The shutter may be equipped with a delay action mechanism which, when set and released, triggers the shutter after a short period of time, in the region of 10 seconds. A threaded socket may also be present for attaching a wire release for the photographer’s convenience. Because a leaf shutter is further from the focal plane, it allows light from the central area of the lens to fall on the entire area of the film at once. This means that the opening and closing of the shutter can be treated as instantaneous, and thus there is no need to adjust the timing to make sure all of the film is exposed for the same amount of time, as with a focal plane shutter. The leaf shutter allows synchronising flash at every available shutter speed, due to the fact that the whole picture area is exposed simultaneously. A focal plane shutter operated at speeds above 1/60s (or thereabouts) exposes a small strip of film moving across the picture area, so that flash sync is normally only available at or below that speed. 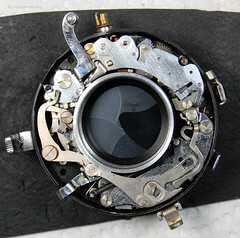 Most leaf shutters for folding cameras have two threads mounts for the the lenses, one in the front side and one in the back. The reason is that most of these shutters have a built-in iris diaphragm. The lenses for these cameras are two-part lenses, each part delivered in an own lens barrel with thread. The reason is that the lenses work best when the diaphragm is placed between certain elements of the lens. This construction allowed also the concept of convertible lenses. The manufacture of leaf shutters is highly specialized, and usually not made by the camera makers them selves. Common types of shutters are the German Compur and Prontor, and the Japanese Copal and Seikosha. Depending on the way the shutter is arranged with respect to the lens, it is referred to as "between-lens" or "behind the lens" shutter. Leaf shutters can synchronise a flash at any available shutter speed. They are generally more compact, less noisy and more durable than focal plane shutters. Less camera shake than focal-plane shutter. They do not distort the image of moving objects (rolling shutter). Leaf shutters are typically not capable of shutter speeds as high as modern focal plane shutters; usually the highest speed possible with a leaf shutter is 1/500th of a second (when?). So sometimes users with leaf shutters have to use ND filters to shoot at maximum aperture at day (e.g. portrait with background blur). Cameras using leaf shutters must either have a shutter in each lens, like the Hasselblad 500, or have the shutter in the camera body, which is a major constraint on optical designs and limits the maximum aperture, like the Paxette. ↑ This is particularly true when electronic flashes connected to the X sync socket are concerned. Flashbulbs of different types, with different time to peak, various flash duration and connected to different sync sockets (e.g. X, M or F) have certain limitations in this aspect - for example S-class flashbulbs can be used at shutter speed not shorter than 1/20 s.
This page was last edited on 5 September 2018, at 00:24.